In an elegant White House guest room, the 11-year-old son of Abraham and Mary Lincoln lay ill in a huge carved rosewood bed, now known as the Lincoln Bed. At five p.m. on February 20, 1862, William Wallace Lincoln died. Elizabeth Keckly, the former slave who designed Mrs. Lincoln's beautiful wardrobe, washed and dressed him. When the president gazed at him, he mourned, "My poor boy, he was too good for this earth. God has called him home. I know that he is much better off in heaven, but then we loved him so. It is hard, hard to have him die!" She watched him bury his head in his hands, "his tall frame convulsed with emotion." At the foot of the bed she stood "in silent, awe-stricken wonder," marveling that so rugged a man could be so moved. "I shall never forget those solemn moments -- genius and greatness weeping over love's idol lost." President Lincoln then walked down the hall to his secretary's office. He startled the half-dozing secretary with the news: "Well, Nicolay, my boy is gone -- he is actually gone!" John Nicolay recalled seeing his boss burst into tears before entering his own office. Mary Lincoln was inconsolable in the loss of her favorite son. To add to the anguish, Tad, her youngest son, lay seriously ill in another room. Both children apparently suffered from typhoid fever, a common illness in disease-ridden Washington, D.C. Willie was the third son born to the Lincolns in Illinois, arriving on December 21, 1850, the same year their second son died. Now with Willie's death, the family circle grew smaller yet. Robert, a student at Harvard College, was the eldest son, the only one who would outlive his parents. In the words of a government official's wife, "The White House is sad and still, for its joy and light have fled with little Willie. He was a very bright child, remarkably precocious for his age, and had endeared himself to every one who knew him." Mary Lincoln's cousin said he was "noble, beautiful ... a counterpart of his father, save that he was handsome." Mary herself called him the "idolized child, of the household." Willie's body was taken downstairs to the Green Room where it remained until burial. Drs. Brown and Alexander handled the embalming, a procedure they would perform three years later after the president's assassination. Willie lay in a flower-covered metallic coffin designed to resemble rosewood, with his name and date of birth and death inscribed on a silver plate. Friends came to pay their respects on February 24, the morning of the funeral. Just before the service the Lincoln family gathered around the coffin for a private farewell. Benjamin French, who supervised the arrangements, wrote, "While they were thus engaged there came one of the heaviest storms of rain & wind that has visited this city for years, and the terrible storm without seemed almost in unison with the storm of grief within, for Mrs. Lincoln, I am told, was terribly affected by her loss and almost refused to be comforted." Mary Lincoln grieved in her bedroom upstairs during the funeral and burial. The funeral began at 2 p.m. in the East Room, where the huge gilt mirrors were draped in mourning, with black fabric covering the frames and white covering the glass. Dr. Phineas D. Gurley, pastor of the nearby New York Avenue Presbyterian Church, conducted the service. The Lincoln family attended Dr. Gurley's church, where Willie recently told his Sunday School teacher he wanted to become a teacher or preacher of the gospel. President Lincoln, his son Robert, and members of the Cabinet sat in a circle, surrounded by a crowd which included representatives from Congress and foreign countries. The writer Nathaniel Parker Willis recalled the service as "very touching." He saw "[General] McClellan, with a moist eye when he bowed in prayer ... and senators, and ambassadors, and soldiers, all struggling with their tears -- great hearts sorrowing with the president as a stricken man and a brother." Following Dr. Gurley's sermon, Dr. John C. Smith of the Fourth Presbyterian Church concluded the service in prayer. 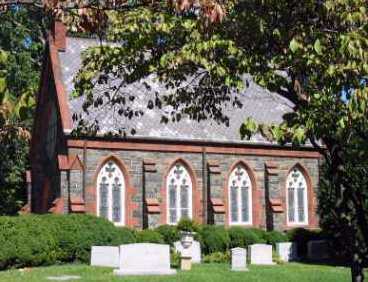 Most of the mourners accompanied the body to Oak Hill Cemetery in Georgetown, creating a long procession. Two white horses drew the hearse, while two black horses pulled President Lincoln's carriage down Washington's unpaved streets and up the hill to the cemetery. When the procession arrived at the cemetery, Willie's body was placed in the small chapel for a brief service of Scripture and prayer. He later was transferred to the Carroll family vault on the cemetery's northwest end (Lot 292). This vault, purchased by William and Sallie Carroll in 1857, contained the bodies of their three sons. Orville H. Browning, a political friend of the Lincolns from Illinois, inspected the vault the day before the funeral with William Carroll, clerk of the Supreme Court. Carroll offered this space temporarily to the Lincoln family until they returned to Illinois. After President Lincoln's assassination in April 1865, Willie's coffin was removed and placed on the funeral train. Both father and son are permanently buried at Oak Ridge Cemetery in Springfield, Illinois. Willie's death left deep marks on the Lincoln family. Elizabeth Keckly said Mary "was an altered woman .... she never crossed the threshhold of the Guest's Room in which he died, or the Green Room in which he was embalmed." The artist Alban Jasper Conant noticed something different about President Lincoln following Willie's death, saying, "ever after there was a new quality in his demeanor -- something approaching awe. I sat in the fifth pew behind him every Sunday in Dr. Gurley's church, and I saw him on many occasions, marking the change in him." John Hay, another White House secretary, wrote that the president "was profoundly moved by his death, though he gave no outward sign of his trouble, but kept about his work the same as ever. His bereaved heart seemed afterwards to pour out its fulness on his youngest child." 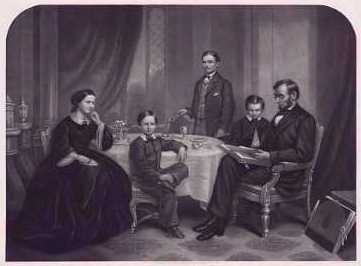 On the day President Lincoln was assassinated, he told Mary, "We must both be more cheerful in the future. Between the war and the loss of our darling Willie we have been very miserable." Sad and solemn is the occasion that brings us here to-day. A dark shadow of affliction has suddenly fallen upon this habitation, and upon the hearts of its inmates. The news thereof has already gone forth to the extremities of the country. The Nation has heard it with deep and tender emotions. The eye of the Nation is moistened with tears, as it turns to-day to the Presidential Mansion; the heart of the Nation sympathizes with its Chief Magistrate, while to the unprecedented weight of civil care which presses upon him is added the burden of this great domestic sorrow; and the prayer of the Nation ascends to Heaven on his behalf, and on the behalf of his weeping family, that God's grace may be sufficient for them, and that in this hour of sore bereavement and trial, they may have the presence and succor of Him, who has said, "Come unto me all ye that labor and are heavy laden, and I will give you rest." Oh, that they may all be enabled to lay their heads upon His infinite bosom, and find, as many other smitten ones have found, that He is their truest refuge and strength; a very present help in trouble. The beloved youth, whose death we now and here lament, was a child of bright intelligence and of peculiar promise. He possessed many excellent qualities of mind and heart, which greatly endeared him, not only to the family circle of which he was a member, but to his youthful companions, and to all his acquaintances and friends. His mind was active, inquisitive, and conscientious; his disposition was amiable and affectionate; his impulses were kind and generous; and his words and manners were gentle and attractive. It is easy to see how a child, thus endowed, would, in the course of eleven years, entwine himself around the hearts of those who knew him best; nor can we wonder that the grief of his affectionate mother to-day is like that of Rachel weeping for her children, and refusing to be comforted, because they were not. His sickness was an attack of fever, threatening from the beginning, and painfully productive of mental wandering and delirium. All that the tenderest parental care and watching, and the most assiduous and skilful medical treatment could do, was done; and though at times, even in the latest stages of the disease, his symptoms were regarded as favorable, and inspired a faint and wavering hope that he was not beyond recovery, still the insidious malady, day after day, pursued its course unchecked, and on Thursday last, at the hour of five in the afternoon, the silver cord was loosed, the golden bowl was broken, and the emancipated spirit returned to God, who gave it. That departure was a sore bereavement to parents and brothers; but while they weep, they also rejoice in the confidence that their loss is the unspeakable and eternal gain of the departed; for they believe, as well they may, that he has gone to Him who said: "Suffer the little children to come unto me, and forbid them not, for of such is the kingdom of heaven;" and that now, with kindred spirits, and with a departed brother, whom he never saw on earth, he beholds the glory and sings the praises of the Redeemer. Blessed be God. Translated to that glorious sphere." It is well for us, and very comforting, on such an occasion as this, to get a clear and a scriptural view of the providence of God. His kingdom ruleth over all. All those events which in anywise affect our condition and happiness are in his hands, and at his disposal. Disease and death are his messengers; they go forth at his bidding, and their fearful work is limited or extended, according to the good pleasure of His will. Not a sparrow falls to the ground without His direction; much less any one of the human family, for we are of more value than many sparrows. We may be sure, -- therefore, bereaved parents, and all the children of sorrow may be sure, -- that their affliction has not come forth of the dust, nor has their trouble sprung out of the ground. It is the well-ordered procedure of their Father and their God. A mysterious dealing they may consider it, but still it is His dealing; and while they mourn He is saying to them, as the Lord Jesus once said to his Disciples when they were perplexed by his conduct, "What I do ye know not now, but ye shall know hereafter." What we need in the hour of trial, and what we should seek by earnest prayer, is confidence in Him who sees the end from the beginning and doeth all things well. Only let us bow in His presence with an humble and teachable spirit; only let us be still and know that He is God; only let us acknowledge His hand, and hear His voice, and inquire after His will, and seek His holy spirit as our counsellor and guide, and all, in the end, will be well. In His light shall we see light; by His grace our sorrows will be sanctified -- they will be made a blessing to our souls -- and by and by we shall have occasion to say, with blended gratitude and rejoicing, "It is good for us that we have been afflicted." Serves but to brighten all our future days." Bayne, Julia Taft and Decradico, Mary (intro). Tad Lincoln's Father. Bison Books, 2001. Cole, Donald B. and McDonough, John J., ed. Witness to the Young Republic, University Press of New England, 1989. Keckley, Elizabeth. Behind the Scenes: Thirty Years a Slave and Four Years in the White House. New York: Ayer Publishing Co., 1968. New York Herald, February 22 & 26, 1862. Nicolay, Helen. Lincoln's Secretary: A Biography of John G. Nicolay. New York: Longmans, Green, 1949. Randall, Ruth P. Lincoln's Sons. Boston: Little, Brown & Co., 1955. Temple, Wayne C. Abraham Lincoln: From Skeptic to Prophet. Mahomet, Illinois: Mayhaven Publishing, 1995. Turner, Justin G. and Turner, Linda Levitt, eds. Mary Todd Lincoln: Her Life and Letters. Reprint edition, 1987. Washington Star, February 21, 22, 24, 1862. Wilson, Douglas L. and Davis, Rodney O. Herndon's Informants: Letters, Interviews, and Statements about Abraham Lincoln. Urbana: University of Illinois Press, 1998.